2004 AUDI S4 WITH A 6 SPEED MANUAL TRANSMISSION AND ONLY 92k. THIS CAR WAS JUST SERVICED AND IS READY TO GO. THIS CAR HAS A CLEAN CARFAX AND AUTOCHECK. PLEASE CONTACT SALES FOR AN APPOINTMENT TO SEE THIS BEAUTY. WE ACCEPT TRADES AND OFFER FINANCING AND EXTENDED WARRANTIES AND SHIPPING OPTIONS. 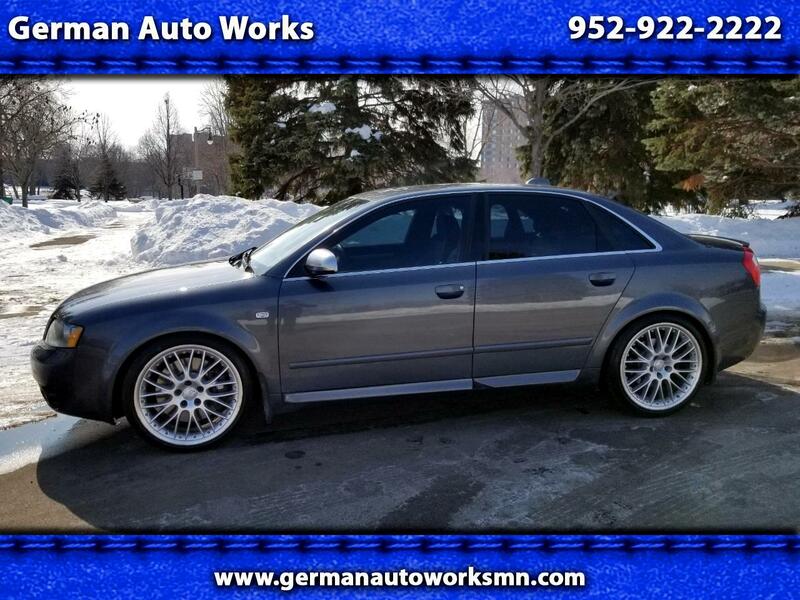 YOU CAN REACH US ANYTIME VIA PHONE OR TEXT AT 952-922-2222 OR ON OUR WEBSITE AT WWW.GERMANAUTOWORKS.COM.